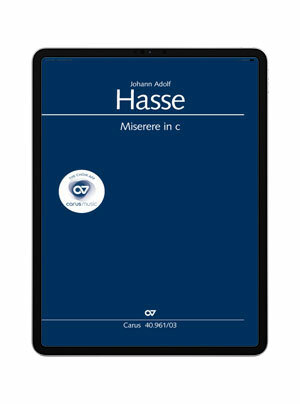 The Miserere in C minor was written for women’s choir but was reworked by Hasse himself for mixed chorus. 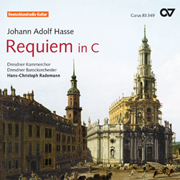 The composition comprises eight contrasting sections which include arias, soloistic ensemble movements, and choruses, expressing comfort, devotion, and mercy. Long, sustained phrases characterize the choruses except for the final chorus. Here, it is essential not to confuse "slow" with "easy": the choral sections can only reveal their effect if the chorus can sustain the arc of tension! In the Allegro assai of the final chorus the trick is not to get faster with the fast tempo and short note values, and nevertheless to maintain the lightness. Experience choral music. Anytime. Anywhere. 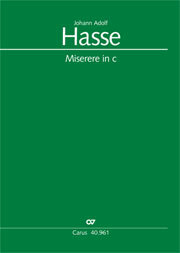 At home and out and about: Straight away your choral works will always be with you to practice! With carus music, the new choir app, you can follow the music whilst listening to a top-class recording on your smartphone or tablet, and easily practice your own choral part with the help of a coach. With carus music, your concert preparation will be easy and efficient to master – and fun!